Reportage is about catching life as it happens by allowing all of your senses to be penetrated by the surrounding sounds, smells, and sight. This adds a sincerity to your art. Reportage teaches you how to cover a situation thoroughly. What’s great about working this way is that no matter how many times I go to a specific location I always find something different to talk about. I love to go someplace, sit down and translate what’s happening into my own drawings, my own words. This kind of work requires an extensive vocabulary of graphics to accurately and elaborately convey your message. 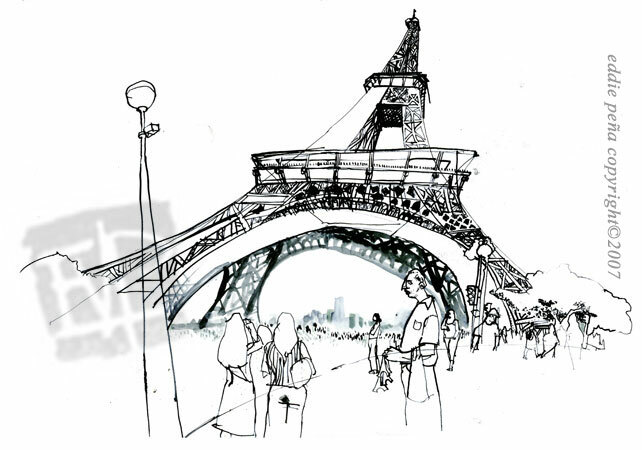 This drawing, of a series of the Eiffel Tower, was done on location in the beautiful city of Paris. It was a hot day, tourists were everywhere. I walked 700 steps to the second level of the tower and then back down. There were con men trying to sell me mini tower souvenirs. I had beer spilled on me from above. You can’t get those experiences by drawing from a picture. Those experiences influence the choices you make when putting that pen to paper. Every drawing I make has a story, has a life of its own. Reportage branched out my career path. I’ve worked in the field of animation, drawn murals for the 3M Corporation, worked in the Package and Toy design industry, designed movie posters, built online video games and my desire is to do much more. You read this list and think the old cliché, “jack of all trades and master of none.” Nonetheless, all of these projects required one thing that I possess, the ability to draw. Even though I have not mastered my drawing ability I hope to never do so, but continue to learn and improve everyday of my life.